' ' Cinema Romantico: Hail, Caesar! It sounds like the set-up to a joke. A Catholic priest, a Greek Orthodox priest, a Protestant minister, a Rabbi, and a Hollywood producer convene at a conference table. 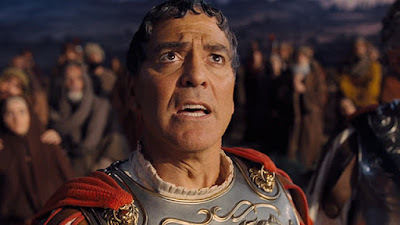 And it is funny, this particular moment in The Coen Brothers’ “Hail, Caesar!” when Eddie Mannix (Josh Brolin), the producer, summons these religious bigwigs to ensure his movie studio’s portrayal of Christ in their forthcoming prestige picture that gives the film its title is accurate. Each clergyman has his own opinion, of course, because each has a different relationship to the creator, but the fact remains that they are all here for the same reason and that is in service to the movies. 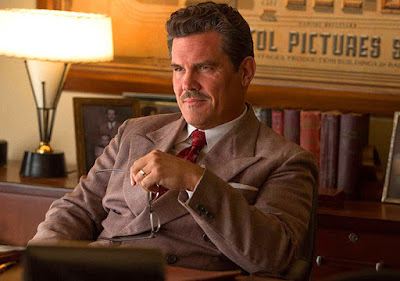 And it is the movies – or perhaps I should say, the pictures, to use the parlance of the film’s time – to which “Hail, Caesar!” so extraordinarily and warmly pays homage above all else. “Warmly?” you might be wondering. Joel and Ethan Coen, writers, directors and producers, those cold, clinical satirists so often determined to unmask the system as rotted within, who just went on record as denouncing the importance of the Academy Awards, are treating the movies – excuse me, the pictures – warmly? Are they not the same Coen Brothers who presented Hollywood in the form of Jack Lipnick, boss of Capitol Pictures in “Barton Fink”, a browbeating philistine who pretended to be on the writer’s side until he wasn’t? Indeed they are and yet “Hail, Caesar!” would suggest the Coens have softened a bit in their stance toward La La Land – or, perhaps to put it more accurately, the Coens have always had a soft spot for the movies, not so much for the business. “Hail, Caesar!” is set in the early 1950's when the studio system ruled Hollywood, and those studios were rife with issues that had to be kept under wraps, which is where Mannix comes in, Head of Physical Production, though he’s really a “fixer”, as if Michael Clayton had been cultivated in the world of Philip Marlowe. He moves about Capitol’s back lot with gruff ease, untangling his stars from their various imbroglios, keeping the moviemaking wheels in perpetual motion. There is the unplanned pregnancy of DeeAnna Moran (Scarlett Johansson), a young western star Hobie Doyle trying with some difficulty to transition to a drawing room romance and then there is Baird Whitlock (George Clooney), star of mighty “Hail, Caesar!” itself, who has just been kidnapped by some mysterious sect calling itself The Future. And all this is under threat of being reported to the masses by Thora and Thessaly Thacker (Tilda Swinton, having a ball), twin news/gossip columnists. You might say these are really only tangentially connected to the story; I’d say these are the story, these silver screen spoils. The Coens have always sought to give life to peripheral moments as much as the pivotal, which is why their concoction of a movie ballad called “Lazy Old Moon” feels like it was stripped straight from a late night showing on Turner Classic Movies and the opening credits of “Merrily We Dance” are enough to make you swoon. And even if these moments, like repeated takes of Baird Whitlock coming face-to-face with Christ, are humorous, they are not insincere, crafted with true affection. Still, Baird's kidnapping becomes vital in its own way, as eventually The Future is revealed to be a group of screenwriting communist sympathizers, a la The Hollywood Ten. Baird, played by Clooney like a handsome cipher, sees their point, only to quickly be cowed by the studio once Mannix rescues him. Movie studios, after all, were not in tune with the communist ideal of common ownership; there was a clear chain of command from the godlike studio head on down. 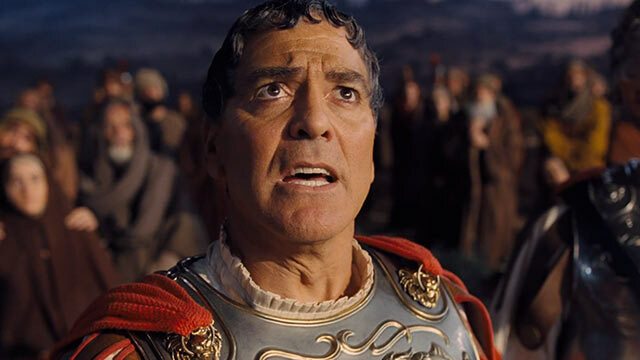 Which is why the recurring idea of religion throughout “Hail, Caesar!” is not tangential but entirely crucial, essentially arguing that in the Golden Age the studio heads were the gods who assigned mortals to do their bidding and allowed other mortals to become gods, their names illuminated by the marquee. Communists, in broad terms, dismiss god as opium of the masses, which might be how the Coens themselves view these motion pictures, mere opium for all us slack-jawed idiots in the audience, nothing more than product put out by self-mythologizing studio toughs to take our money. But even if that’s true, boy oh boy, does that opium still taste good.